The 2016 Kona Worlds just wrapped up in epic conditions in Islamorada, Florida! 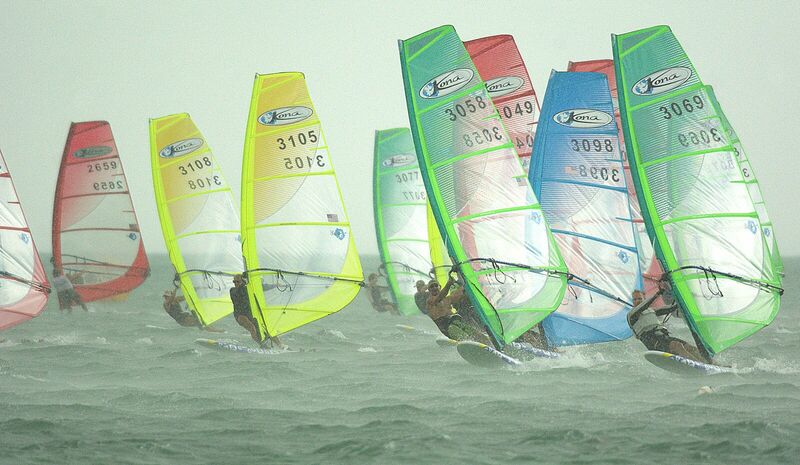 With more than a hundred competitors from all corners of the world, the action on the water was fierce. But beyond the racing action, the Worlds are first and foremost a chance for the Kona community to get together, rekindle friendships and welcome new members. “Grow the flower,” as Kona CEO Joachim Larsson likes to say. Two of the biggest names in attendance this past week were Beth Winkler and Andy Brandt. And while Beth has been racing on Kona for many years already, it was Andy’s first major championship in the class. 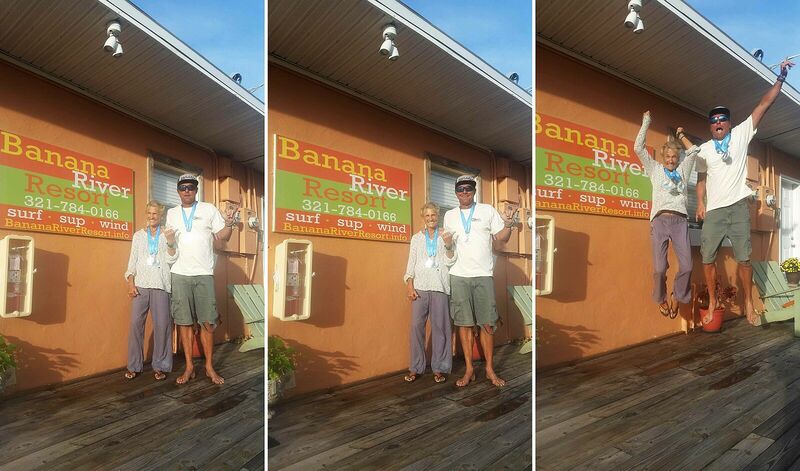 After the event concluded in the Keys, they both headed a few hours up the coast to Beth’s famed Banana River Resort in Cocoa Beach, where the indefatigable Andy was scheduled to run a 3-day freestyle clinic. It was a chance for them to sit down for a few minutes and reflect on the excitement of the past week! ANDY: Beth, you were at this event two years ago already, weren’t you? BETH: Yes! I raced the first day at the 2014 Kona Worlds, but I was not able to complete that event and I don’t like to leave things unfinished! 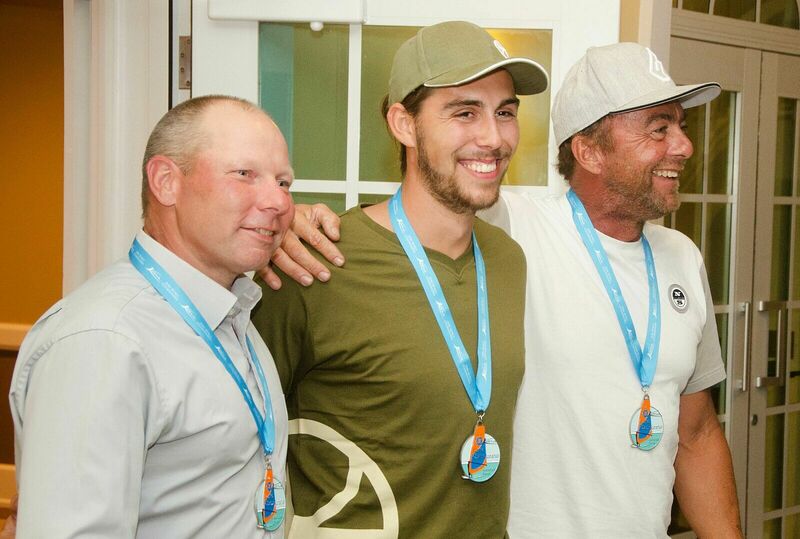 I came back this year mainly to be with my windsurfing family – but also to finish what I started 2 years ago. ANDY: And you did great! BETH: I did! I went in with no expectation other than to do my best. I was just happy to be a participant, believe me! But I finished 3rd woman and 3rd in the lightweight division! I raced in the Gold fleet – that’s what I had registered for – but for some reason, I was scored in the Silver fleet at the end of the first day. I’m assuming because of my age? LOL, it took me a little while to sort that out, but we did. Speaking about scoring, you didn’t do too bad yourself! You nearly got on the podium in your first Kona World Championships! Major props! ANDY: Thanks! I finished in 4th place overall, and 2nd in the light-heavyweight division. I’m very pleased with my results. I was the 2nd-ranked American too, and I managed to win the freestyle contest at the end! Going into the week, I was hoping to finish in the top-20, but after the first few races, I thought a top-10 finish was within reach. But I didn’t expect to finish in the top-5! BETH: How about that 4th race? ANDY: It was epic! There wasn’t very much wind at the start, right? But you could see the storm coming. BETH: Oh yes, we all saw it coming! ANDY: I was deep in the fleet after the first lap, and when the storm hit, the rain was so intense that I couldn’t see anything anymore! I was hanging on for dear life, getting slammed, and somehow maintained some direction around the course. I sailed across the finish line in the rain storm, asked Darren (ndlr: race director Darren Rogers) how I had finished, and somehow managed to finish in 4th! BETH: That squall was intense! I too managed to get around once before it really broke loose, and on the second go round I could do no more. I resorted to singing in the rain as I drifted downwind to the committee boat, and then I sailed in. Lesson learned? Haha, I don’t think so! For the sake of the race! 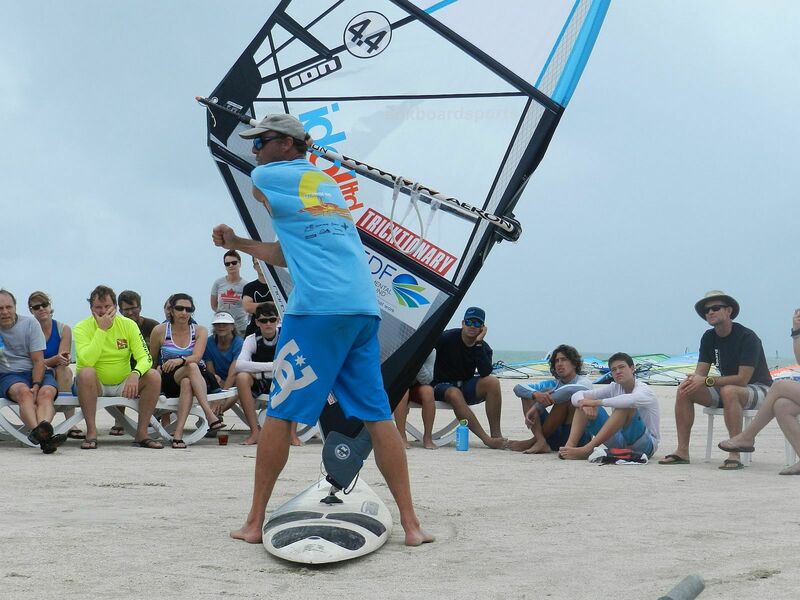 ANDY: The high-wind conditions took a toll on everybody, but you had the energy to not only do all of the races, but also do freestyle after racing every day, and even compete in the freestyle contest on the last day! How did you do it? BETH: I have been training my entire life for one thing or another. I’m still training my body for life, and thus I was able to compete in the extreme conditions. I think strength training is very important as I get older and more brittle. I feel it paid off! 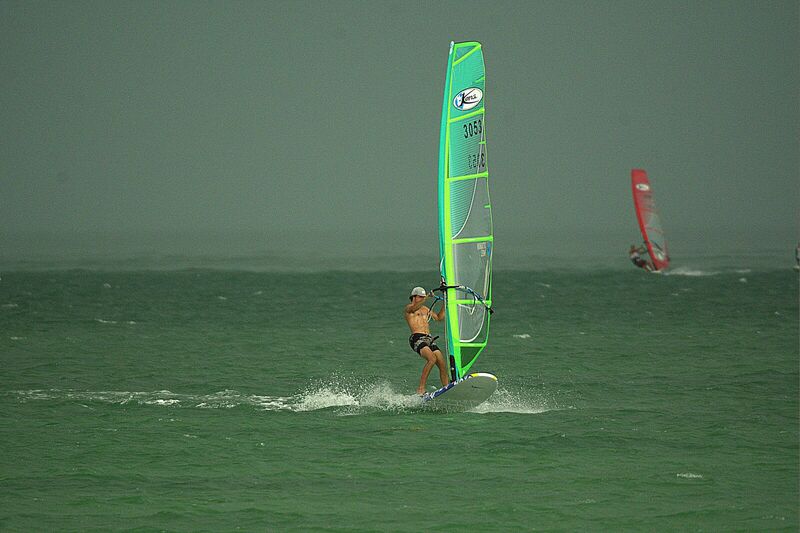 I love small sails and small boards, and in Florida those conditions are rare. The wind was blowing non-stop and I had my personal gear ready, so there was no excuse! 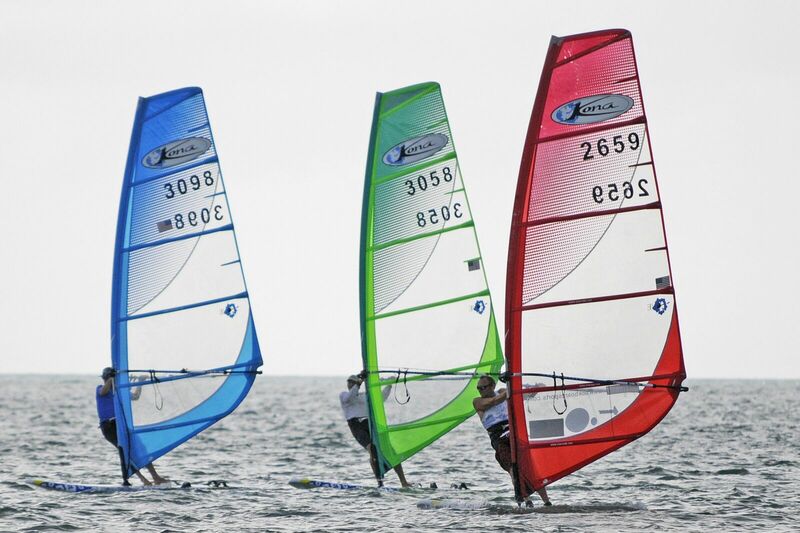 ANDY: Freestyle makes such a big difference in one’s sail handling and board handling when you’re racing. From being able to hold your position at the start, to having effective tacks and jibes on the course. During that 4th race when we had that huge squall, I feel like freestyle gave me the tools to help me survive and finish the race. BETH: You have plenty of racing experience too. ANDY: For sure. I’ve raced a lot of one-design as a kid, and I raced in Islamorada a lot too when I was young – in the Islamorada Pro-Am. I also competed at the Techno Nationals there many years ago. I heard all about this event a couple of years ago and I’ve been looking forward to the 2016 edition for over a year! I really like the Kona concept. It really seems to work well with the different sail sizes for different weights, as there were competitive people in all weight divisions. The board is easy to sail and control, which makes for fun racing! BETH: One-design is the key. BETH: People sometimes ask me whether Kona racing is similar to racing one-design on a longboard or similar to racing one-design on a shortboard, like a techno. I guess longboard, but one-design is one-design, right? It makes no difference if it’s a door with a flour sack for a sail! If everybody is on the same stuff, you can’t blame the equipment. 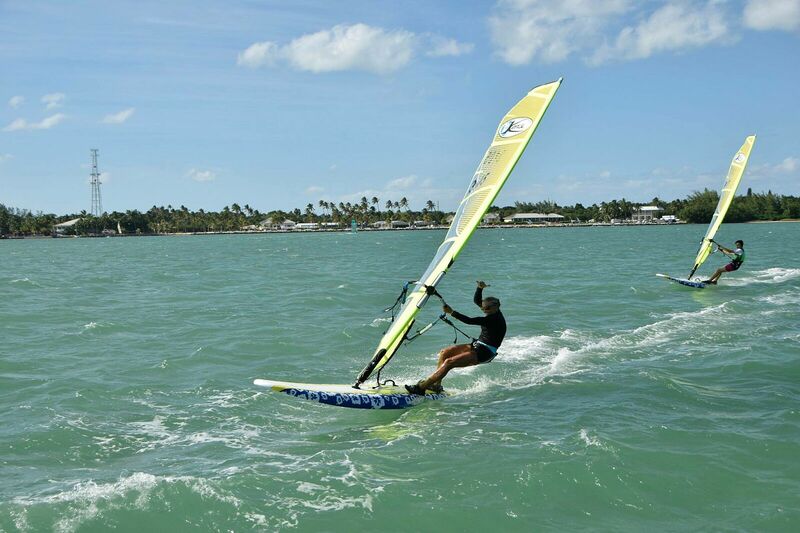 ANDY: The Kona Class seems to be the perfect class to attract women to windsurfing. But there were relatively few women at the event. What can we do to attract more women? BETH: Start a Kona Girls’ Night? Girls’ Day with free daycare? I saw plenty of moms at the event watching their kids on the water – let’s get them on a board! Speaking of kids, those kids at the top were flying! Do we chalk it up to youthful energy, or is there anything in particular that they’re doing better than others? ANDY: They had great starts and speed with the daggerboard down. They knew all the lay lines. Some nice tricks with the uphaul sailing upwind too, and their rigging was on point. I also noticed that they kicked their daggerboard up as soon as possible. I did the same, but they had way, way more Kona experience than I did. BETH: So, did you catch the bug? ANDY: Absolutely. I really enjoyed the Kona racing, and I hope to come back and do more events! Unfortunately the ABK boardsports schedule is full and it’s difficult for me to get away. But I sail the Kona for fun when I can when I travel. Before the event, to prepare, I went on long-distance cruises with my Kona in California, with a backpack, sailing to different towns for fun and in pretty good wind. I raced one local Kona regatta in Sacramento and I did a long distance sailboat race on the Kona from Rio Vista to Sacramento. I had no testing against other people at the level of the Worlds, but I put some mileage on the board! So it’s safe to say that I will continue to sail it this fall, and then definitely next spring when I get back to the US. BETH: And the food at the event – it was outstanding! ANDY: The organizing committee came through for us, didn’t they? The location, the conditions, all the fun people I met and the new friends I made – it was pretty special. BETH: It was! Twelve races in tough conditions, all executed in style. The most exciting part for me was the family participation. BETH: Not just seeing the old-timers get back in the game, or a new generation of kids joining all the fun. Both are great of course, but what makes a Kona event so special is the family experience. Age doesn’t mean anything to me, you know? I seem to get a lot of attention because I’m not that young anymore, but I don’t really think about it until I look in the mirror. On the water and around my friends, I feel like I’m 12 years old! Kona Worlds was a fabulous event. I’m so glad that I participated. Everyone was incredibly helpful and supportive to me as a Kona newbie. I’m going to spread the Kona stoke! Looking back at the photographs of that intense squall line and ultimately the deluge that hit, I’m still amazed and in awe of the sheer tenacity these competitors exhibited dealing with it. You all have my utmost respect! One design rocks and I appreciate that Kona allows for we larger individuals with the ‘sail by size’ element of the class. I can’t wait for the year I can break away from work to attend more well-run, Florida events. Hey Andy, We met on Sun at Golden Gardens. My cell is 423-619-7539. How mush are you going to charge for instruction? Next story My road trip to the Kona Worlds! Previous story Pumpkin Cup Riders!